Hertfordshire is a thriving county. At the beginning of December, a report by Grant Thornton and Hertfordshire LEP reported that the top 200 privately-owned businesses in the county had a combined turnover of £15.4bn, up by 12.3% on the previous year. Employment was also up 5.8%. Overall, the survey found that Hertfordshire had above average scores for Resilience & Sustainability, Dynamism & Opportunity, and Health, as well as Wellbeing & Happiness. With the large companies doing so well, it’s bound to have a positive trickle-down effect to benefit local SMEs, sole traders and freelancers. Whilst Hertford is sufficiently far away from London to avoid the capital’s business rents and rates, it’s close enough to make it easy to travel into the capital for client meetings. With two railway stations providing regular services into Liverpool Street, King’s Cross and Moorgate, it’s easy to pop down to London. 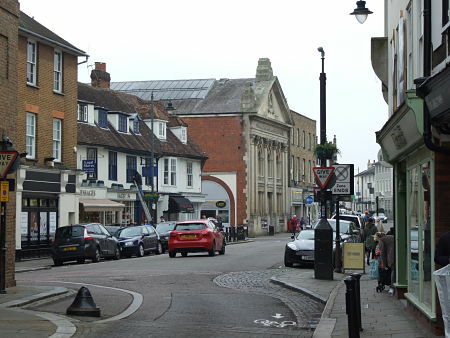 Hertford and the surrounding towns are extremely well served with networking groups, giving you the opportunity to talk to people from other local businesses working in all sectors. In Hertford, you’re bound to find at least one group that suits you, with everything from informal drop-in meetings to formal members-only breakfasts and lunches. Give all of them a try – even with membership-only groups, you can usually visit two or three times as a visitor to see if it’s for you, so take advantage! Click here for some tips about how to make a good impression at networking events. SMEs make up 99% of UK businesses, and in Hertford there is a great sense of community and loyalty amongst small business owners. And if you rent coworking office space, you’ll be part of a business community by default! If you’re a sole trader, freelancer or have just set up your new business, save money on office rent by using our co-working office facilities at the UOE Hub in Hertford. Get in touch now for a FREE one day trial!